New campaign positions pork as healthy as chicken but a staggering 90% of all pork sold in the UK is intensively farmed. Lizzie Rivera reveals the truth behind the pork we eat, the murky world of food labelling, and how supermarket dominance is at fault. Free-range pigs at Fernhill-Farm. This type of high-welfare farming is far removed from the reality of how much of British pork is made. Pork is making a comeback. 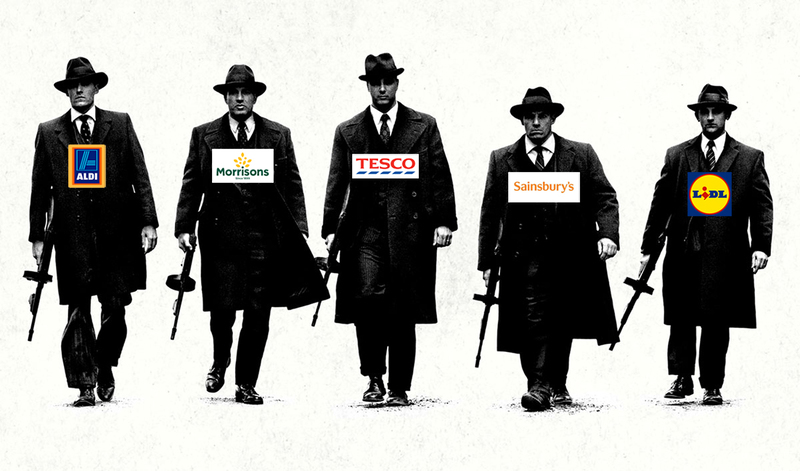 Its decline in popularity has been so slow you may not have noticed it – but farmers and supermarkets have. So a new campaign has been launched to rekindle our love of the majestic-sounding pork medallion, firstly by taking on chicken (whose popularity has soared) and secondly by taking on the Oxford English Dictionary. Yep, a pig farmer hit headlines last week by formally requesting the phrases ‘pig-out’, ‘eat like a pig’ and ‘porker’ are removed from the dictionary because they are offensive to the animals that are, in reality, no greedier than any others. In fact, British pigs are now 44% leaner than they were in the 1970s, while us greedy-hogs – oops! humans – are 30% fatter, according to the latest data from the Agricultural and Horticultural Development Board. The new Love Pork campaign encourages people to eat more pork but 90% of all pork sold in the UK is intensively farmed. Sales of pork fell by 8% between 2013 and last year, with around one million fewer households buying pork. Meanwhile sales of chicken, touted as the healthy white meat, soared by 18%. A significant factor of this decline may have been the World Health Organisation’s warning in 2015 that processed and cured meat ranked alongside cigarettes as a cause of cancer. The evidence that links a high intake of red and processed meat to poor health is growing according to the British Dietetic Association (BDA). It is not yet clear why this is, but one theory is the higher saturated fat or salt intake in foods such as burgers and sausages, and the typically un-healthier lifestyles of the people who regularly consume these foods. The key point here is “high intake”. 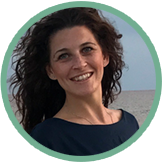 Dr Frankie Phillips, registered dietitian and spokesperson for the BDA, says the official recommendation is to eat less than 70g of red meat per day – about the amount in a pork medallion. She also highlights how pork is also rich in protein and provides a source of a range of essential vitamins and minerals. 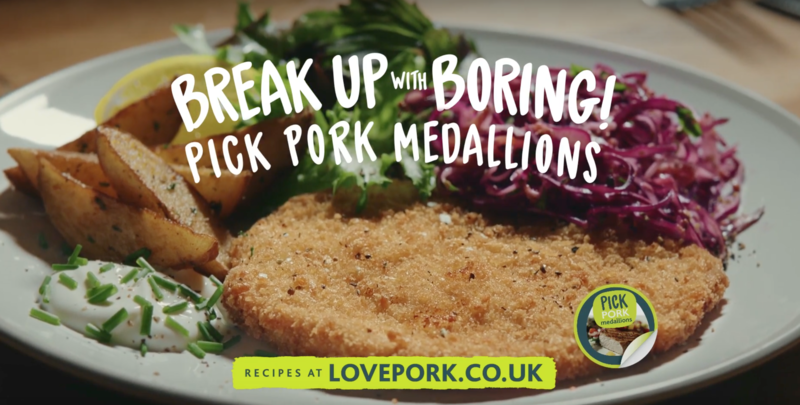 Hence the new “Love Pork” marketing campaign, which presents pork as healthy as chicken by highlighting that a pork medallion contains a whole 0.03g less saturated fat than a skinless chicken breast. As our last report on chicken investigated, there’s a lot more to the arguments for how “healthy” a meat is for you than the simplistic fat and protein content marketing message. 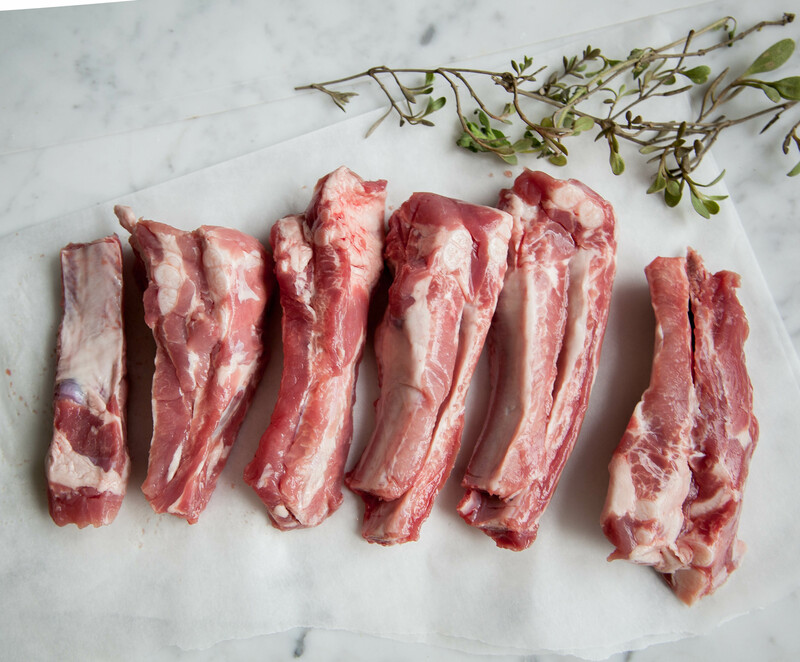 And there’s a huge range of pork to choose from – from intensively reared to free-range and organic. So, while “Love Pork” is not telling outright porkies, they’re not telling the whole truth either because the way a pig is farmed has a significant impact on its nutritional value. And that is another reason we’re seeing a decline of meat sales generally – consumer concern for animal welfare. A report by the Bureau of Investigative Journalism last year revealed that the number of intensive farms (housing 2,000 pigs for grown meat) in the UK has risen by a quarter since 2011. 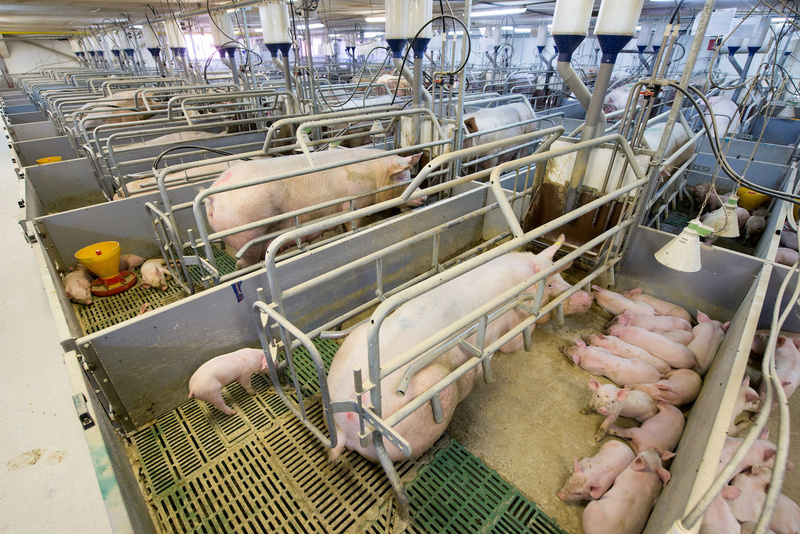 “Mega Farms”, which hold at least 2,500 pigs, are also increasing at a concerning pace with the largest UK pig farm able to hold a staggering 23,000 pigs. Piglets suckling their mother on an intensive pig farm. Intensive farming now accounts for an incredible 90% of all pork sold in the UK, according to Philip Lymbery, chief executive Compassion in World Farming (CIWF). When it comes to pigs, what passes as acceptable is pretty horrifying. Piglets are born to sows in farrowing crates, which are so small the sows can’t even turn around. Unstimulated, their tails will have been docked by the time they are transferred to pens at three weeks old (without anaesthetic if they were under seven days old) to stop them causing serious damage when they bite each other as their boredom turns to aggression. The growing pigs live on hard slatted floors so the excrement they live in can conveniently be washed away. Fed growth hormones to grow quickly, commercially reared pigs are ready for slaughter from five months old, twice as fast as higher welfare breeds which grow at a more natural pace. They are fattened up on cereals and are fed routine antibiotics because diseases spread quickly in tightly packed conditions and they haven’t fed from their mother for long enough to build up immunity. In September 2016, a study by organic certification body Soil Association revealed 63% of pork samples contained antibiotic-resistant E. coli. Farms Not Factories have campaigned against the intensive farming of pigs – a farming system which is heavily reliant on antibiotics. “In Britain, a nation of animal lovers, most of our pigs are in factory farms in conditions that in my view can only be described as utter deprivation,” says Lymbery, who believes it’s supermarkets who have benefited from this centralisation of supply. 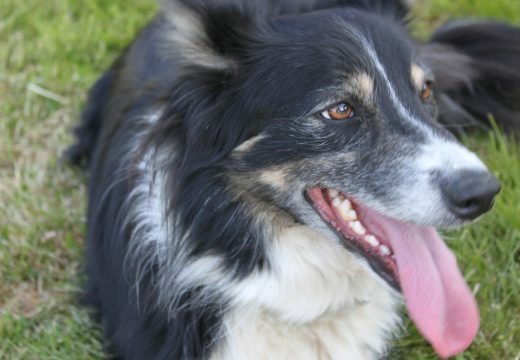 But over the last decade supermarkets have also realised consumers want their animals to be treated better. This doesn’t necessarily mean they have to treat the animals better – just market them to suggest this is the case. He points to research that shows simply adding the word ‘fresh’ leads to about 30% of consumers believing products are more free-range than they actually are. 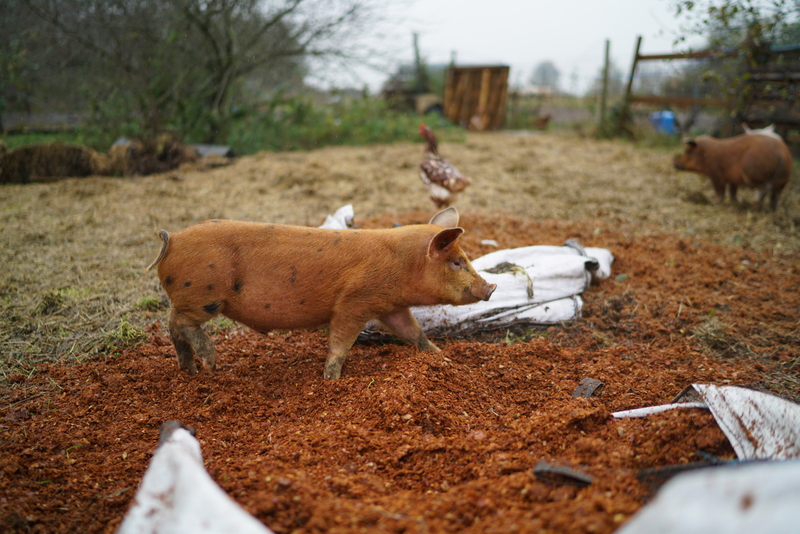 A free-range, organic pig at Purton House Organics farm in Wiltshire. At the other end of the spectrum a luckier 10% of pigs are raised in truly higher-welfare, free-range and organic conditions. Pigs are very sociable animals and when given the chance they will happily spend their days grazing or rooting the ground with their sensitive snouts – or wallowing in the mud to cool down. If it’s cold, shelter with plenty of straw is their perfect hideaway. Given the opportunity to behave naturally, pigs on these farms will automatically designate themselves a toilet area – away from where they live and eat. 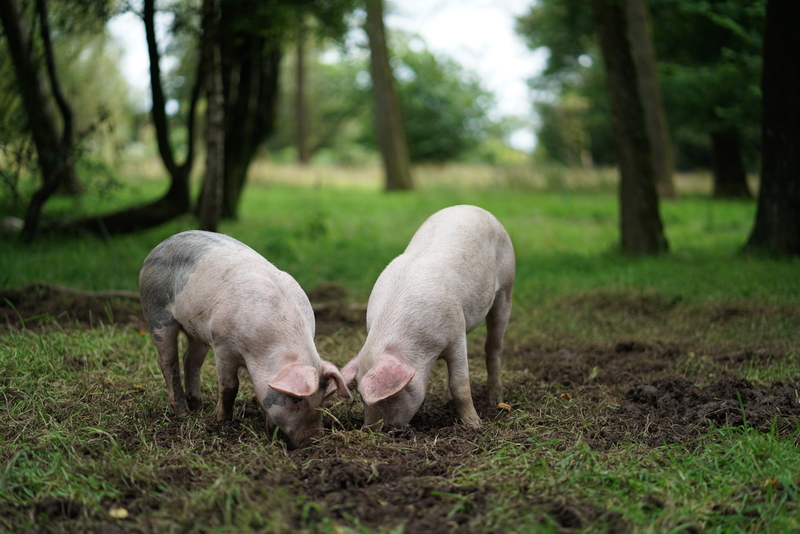 This style of farming goes hand-in-hand with passionate and enthusiastic farmers fighting to keep the rarest pig breeds in existence – such as the Gloucester Old Spot, The British Saddleback and The Tamworth. At Fernhill Farm, there are just two Saddleback sister sows, who each have the potential to produce about 24 piglets a year. These animals get to live as a family unit in eight acres of land and rotate around the woodlands and gardens to cultivate, fertilise, clear scrub and help to reclaim unmanaged woodlands. One of Fernhill Farm’s two saddleback sows with one of her piglets. “We consider them as part of the team, clearing up windfall apples, garden and vegetable waste, weeds and consuming large quantities of fodder beet throughout winter,” says owner Jennifer Hunter. 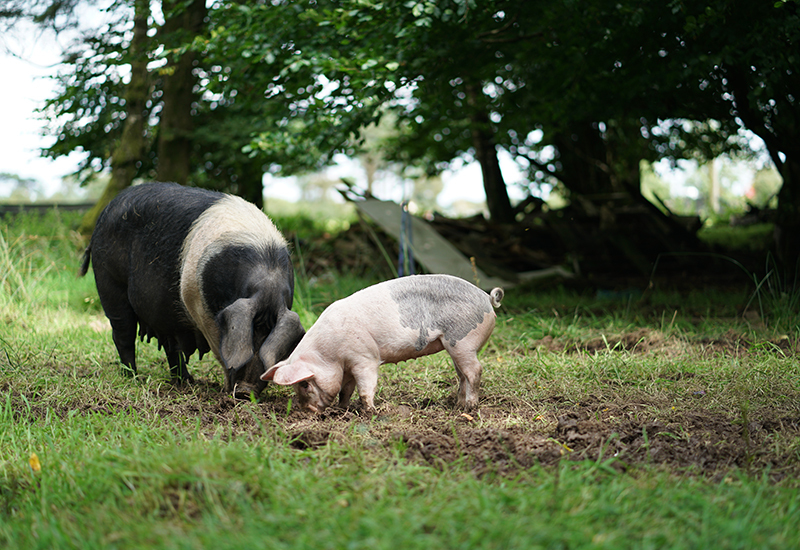 The Saddleback is one of the original British breeds of pig and is gentle and quiet perfectly suited to life outdoors, with great bacon potential. 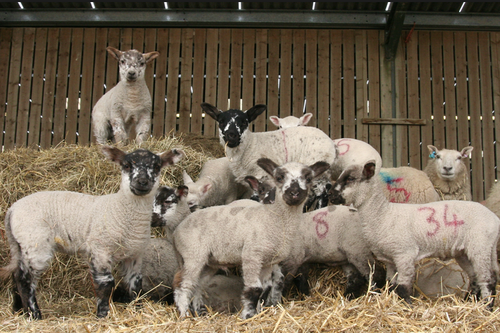 Rare breeds have been phased out of commercial farms because they don’t grow quickly enough, but unsurprisingly the quality of the meat is incomparable. It will have depth of colour and be full of flavour, fry beautifully in its own fat and it won’t release grungy water. Some British farmers are even turning rare breed meat into charcuterie – with impressive results. British Salami from Marsh Pig, for example, typically has a third less fat so you get all of the flavour without the greasy after taste. Of course, meat from these pigs is more expensive – and some cuts can cost the same price as a steak. It’s a tough sell to re-educate consumers who have lost touch with how their food is really produced. But, somewhat ironically, these pigs need to be eaten so they can continue to be farmed and ensure the survival of the breeds. The rise in popularity of nose-to-tail eating means even a pig’s head now comes with a price tag of about £15, whereas butchers were literally giving them away a few years ago. Yet, the head is still the most undervalued part of the pig, according to chef James Golding, who uses it to make Bath-chaps (cured and smoked pork cheeks), braised cheeks and crispy ears. As chef director of The Pig ‘restaurant with rooms’, who rear their own pigs, you’d expect Golding to be a big fan of pork. “It is so versatile and tasty, whether you’re roasting a shoulder for dinner or making a paté, every product is packed full of flavour,” he says. But there’s one condition. “As long as it’s responsibly reared, it’s a beautiful meat.” To Golding, the difference between a quality piece of pork and a cheap one is huge. The message to eat less but higher welfare meat is no longer just about animal welfare but human health as well. The difference between low-welfare and high-welfare farming also impacts the nutritional value. For example, the biggest nutritional difference between organic meat and non-organic is that organic meat contains around 50% more beneficial omega-3 fatty acids, according to a report published in the British Journal of Nutrition. Plus, organic meat was found to have slightly lower concentrations of two saturated fats linked to heart disease. Organic and truly free-range pigs are reared without the routine use of drugs, antibiotics and wormers common in intensive farming. This is especially important in light of reports highlighting how the overuse of antibiotics in farming is undermining the treatment of infections in humans. Suddenly the advice to eat meat less often so we can afford to eat better quality doesn’t seem so unreasonable, it seems necessary. This is where buying cheaper, less common cuts can provide the best of both worlds. The meaty chump, from the rump, is easy to cook in a pan or under the grill. The cheek, from the other end of the pig, is fatty and great in a stew. Deboning, stuffing and rolling the loin can make it go further – and removing the skin to make a tasty crackling makes this go further still. Of course, the shoulder can be slow-roasted until tasty and tender, but it can also be minced for a delicious, slow-grown and slow-cooked ragu. Shop for high-welfare and organic pork at farmdrop.com.